Eloy has a desert location in the middle of the Santa Cruz Flats, close to I-10 about half way (60 miles) between Tucson and Phoenix, 15 miles southeast of Casa Grande. The city center occupies about one square mile along Hwy 84, though the boundaries are much larger, extending north towards the I-10/I-8 intersection and south to the edge of the Sawtooth Mountains. Most lodging in town is along I-10, at exit 208 (Sunshine Blvd) and 200 (Sunland Gin Road). Area facilities include Eloy Municipal Airport and Robson Ranch Sports Club, which offers many fitness activities to residents and guests. Eloy provides the closest accommodation to Picacho Peak State Park, a quick 13 mile drive southeast along the interstate; this popular location features hiking trails across the slopes of an ancient volcano. Other natural areas nearby are Sonoran Desert National Monument (35 miles) and Casa Grande Ruins National Monument (20 miles). Quality Inn Eloy is centered on a courtyard garden with outdoor pool, patio and a few palm trees, at the Sunland Gin Road exit of I-8 but far enough away (a quarter of a mile) to escape the traffic noise. There are three restaurants nearby, though the place is largely surrounded by sparsely developed desert lands; most facilities are in Casa Grande, 7 miles away. 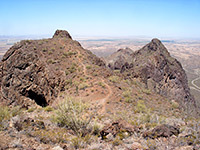 Recreation sites in the neighborhood include Casa Grande Mountain Park (7 miles) and Picacho Peak State Park (20 miles). Free hot breakfast is provided. Highlight of Super 8 Eloy is the attractive outdoor pool, lined by bushes and palm trees, situated in the middle of the parking area, which is enclosed on three sides by the two story, exterior corridor accommodation blocks. There is a gas station adjacent, and two restaurants, plus a travel center on the far side of I-10; otherwise the surroundings are a mixture of residences and undeveloped desert; the inn sits beside exit 203 of the interstate, 3 miles south of the I-8 intersection. All rooms contain a microwave & refrigerator, while the motel also offers free wi-fi and free continental breakfast. The Rodeway Inn is one of several motels by the I-10/I-8 intersection, 7 miles southeast of Casa Grande and 60 miles from Tucson; if offers the usual facilities of an outdoor pool, guest laundry, free wi-fi and free coffee. Rooms (all containing microwave/refrigerator) are on two exterior corridor floors, looking out across the central parking lot to a travel center beyond. There is more parking space at the rear, big enough to accommodate large trucks. Access is from I-10 exit 200, immediately south. Serving Eloy, Coolidge, Arizona City and Toltec as well as Casa Grande, the Motel 6 is a small, basic but reasonably-priced establishment with amenities of an outdoor pool, internet access and guest laundry. Rooms are on two floors with exterior corridor rooms; some have a mini refrigerator. The property is built at the edge of undeveloped desert beside exit 200 (Sunland Gin Road) of I-10, about half way (55 miles) between Phoenix and Tucson. There are a few fast food restaurants and gas stations close by.